Anna B Pratt students, were given the first preview of our new handwashing program! 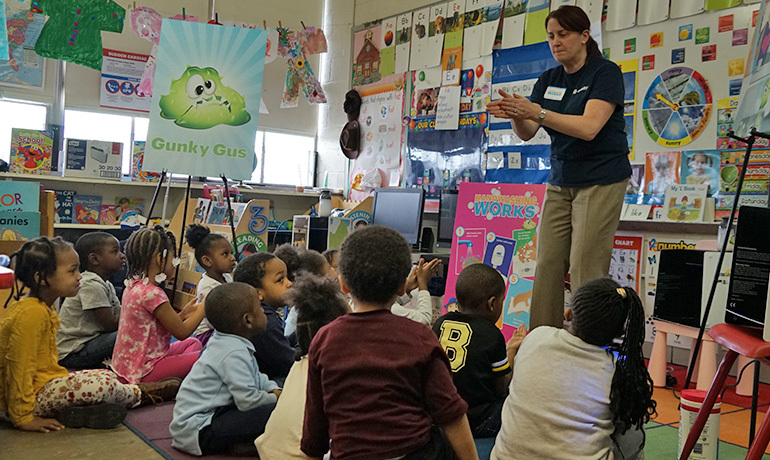 Six Pre-K classes of apx 18 students each met our new hand hygiene characters Zoey, Jake and of course the infamous Gunky Gus, a sneaky germ that shows up in lots of unexpected places. A team of 6 Handwashing Helpers, led by Essity’s Diane Engler, assisted with the lesson and helped the children learn the correct steps and techniques. The children took very well to the new program and were very excited to wash up! This school is our pilot group for the Handwashing Works Study and the students will be evaluated pre and post lesson to gauge the level of knowledge that they retain about proper handwashing.